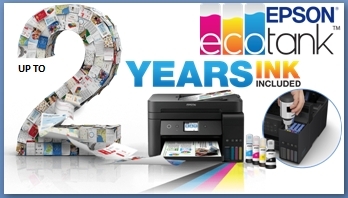 Expand your potential with this A3 4-in-1 inkjet. It offers high-quality, low-cost-printing and flexible wireless solutions including NFC1. Think big with this high-quality 4-in-1 with single and double-sided printing, scanning and fax all up to A3. 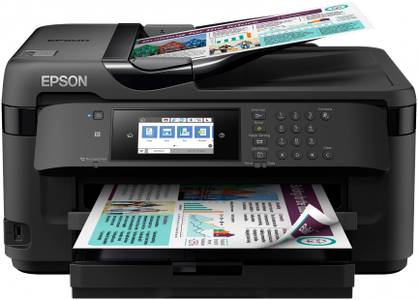 You’ll stride through tasks with print speeds of 18ppm in black and a 35 page A3 automatic document feeder (ADF). And that’s not forgetting its cost-effective inks and flexible wireless connectivity solutions such as NFC and Scan-to-cloud. This A3 4-in-1 printer will meet the needs of even the most demanding home office and small office users. It offers double-sided (duplex) printing, scanning and faxing all up to A3, plus its automatic document feeder can process up to 35 double-sided A3 pages. Furthermore, its PrecisionCore printhead produces high-quality, laser-like prints. This efficient, reliable and fast model offers A3 double-sided printing and print speeds of 18ppm in black and 10ppm in colour2. It’s also simple to operate directly thanks to its intuitive user interface and 10.9cm touchscreen. Print from anywhere in the office with Wi-Fi connectivity or use Wi-Fi Direct to print from compatible wireless devices without a Wi-Fi network. You can also print via NFC with a simple tap of a compatible Android device on the printer. Epson's free mobile printing apps and solutions provide further versatility; Email Print allows you to send items to print from almost anywhere in the world. And with Scan-to-Cloud, you can enjoy the benefits of collaborative working.